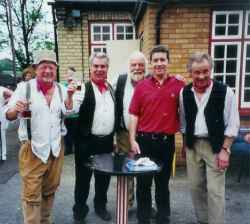 The night of 3rd June 1999 will long be remembered in the sleepy North Herts town of Hitchin as the night the Wurzels hit town. The Cricketers pub played host to a taste of the Wild West Country seldom seen around these parts, where scrumpy drinking and dung spreading are, relatively speaking, minority interests - at least, they were before now! 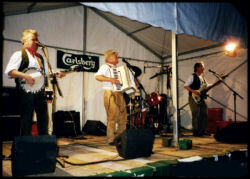 Even mine hosts Kevin and Kim were unprepared for the astonishing spectacle as hordes of Wurzels fans descended on the garden and car park behind the pub, where the band were booked to appear on stage under a marquee. The lucky 200 or so who were able to get tickets for this extremely rare event witnessed unprecedented scenes as Wurzelmania! swept through the crowds. 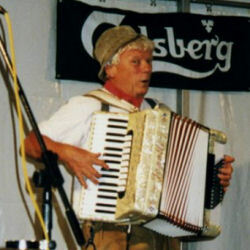 For those who thought Wurzelmania was just a passing sixties and seventies phenomenon, the Wurzels had a message: Wurzelmania is not back - it's never been away. And it's here to stay! From the minute the band stepped up onto the stage and launched into the first number The Blackbird, it was clear that the magic of the Farmyard Four was as strong as - if not stronger than - ever. Twenty-five or thirty years just melted away as the band - who started back in the swinging sixties in the "beet group" era, progressed through the scrumpy-induced so-called "cyderdelic" period (culminating in the celebrated "Summer of Scrumpy" in 1967) then progressed on to become the 1970s chart-topping supergroup - put on an unforgettable performance as good as you'll see anywhere. The hits kept on coming - I Am A Cider Drinker, Combine Harvester, Farmer Bill's Cowman, Morning Glory - as well as some of the old Adge Cutler classics, including Champion Dung Spreader; and perhaps lesser-known but nevertheless excellent gems such as Tommy's rendition of Keep Yer 'And On Yer 'A'penny. The band were sharper than ever and the performance was polished. The powerhouse rhythm provided by John, the young drummer of 76 years, and Dave on bass, allowed Tommy on accordion and Pete on banjo and guitar free rein to strut their stuff. And that's exactly what they did, to the delight of the fans - some of whom, incidentally, must have been a mere twinkle in the milkman's eye when the lads were belting out Combine Harvester on Top Of The Pops back in the heady days of the 1970s. These young 'uns were dancing in the aisles - well, in the car park! - as the boys worked their way through a sparkling set of about an hour. The banter between Tommy and Pete was effortlessly funny, and Pete's voice can still knock over a pint of cider at fifty yards. The single set closed with the song that started it all back in 1967 - Drink Up Thy Zider. The lads received a standing ovation (well, there weren't any seats!) and fought their way back through the crowds into the pub just before closing time for a well-deserved pint. Now that North Herts has had a taste of Wurzelmania let's hope we don't have to wait very long before they return! Thanks to Kim and Kevin for making it all happen - and of course to Pete, Tommy, Dave and John for a fantastic show! "An' on me vest an' underpants 'e scored a direct 'it!" "Keep Yer 'And On Yer 'A'penny"
"Looks like Eric Clapton-in-Gordano to I..."
"Another two pints over 'ere, Kevin!" "Get the beer in, Pete!" In a sad postscript to the above review, I'm sorry to report that a planned return to the Cricketers in Hitchin by the Wurzels has had to be cancelled following complaints about noise from the pub's neighbours. 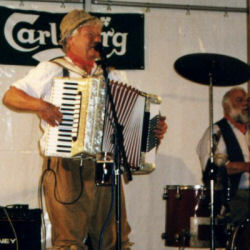 Following the great success of the Wurzels' gig in June 1999, landlord Kevin Butler immediately booked the band again for a repeat show in early October. 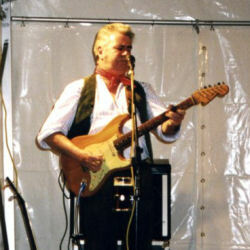 However, the gig had to be cancelled when the North Herts District Council revoked the pub's entertainment licence after complaints by local residents about noise. The sad story is told in an article headed 'Loud' Pub to drop Wurzels in the local paper Hertfordshire On Sunday, 12 September 1999. Kevin and landlady Kim pointed out that the pub is on the busy A600 Bedford Road and faces the Butts Close site of regular noisy funfairs throughout the year, so the residents are hardly used to a life of silence. Said Kevin: "We got a couple of complaints from neighbours but they have ruined the enjoyment of hundreds of people. One strike and we were out - no one from the council came round to get us to turn the sound down so we didn't know we were doing anything wrong. No one is stopping the funfair. If the council would come and help us set the right noise levels, we would be happy to do it". It seems strange that people living near such a long-established pub should expect freedom from noise at all times. Concerts by the Wurzels and other artists were always over by 11pm so it is difficult to see why such complaints should be upheld in this draconian way. 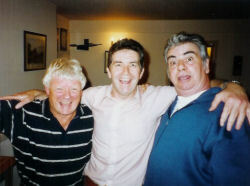 The pub now faces an uncertain future as without its entertainments licence its viability is in question. 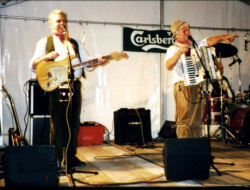 It seems a great shame that the Wurzels will never be able to appear at the pub again after such a great show. 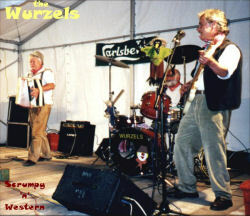 Wurzels sightings are rare enough in Herts as it is, and it looks as if local residents, many of whom have become firm Wurzels fans thanks to Kevin and Kim, will now have to travel further afield to get their regular Wurzels fix.